This gorgeous Rainbow Cake features moist yellow cake, striped rainbow frosting inside, and a light and fluffy cloud-like meringue on the outside! Make it for St. Patrick’s Day, or any fun party! 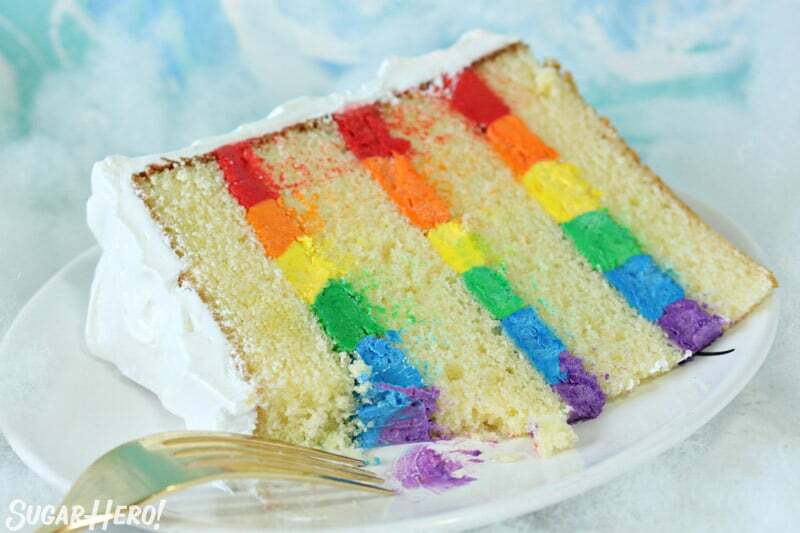 Rainbow cakes are the perfect party cake. They’re bright and happy, gender and age neutral, and are appropriate for everything from birthdays to showers to St. Patrick’s Day gatherings. 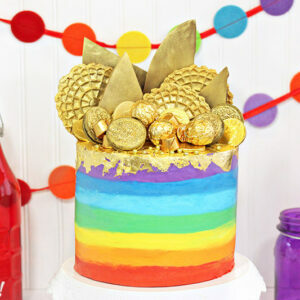 I’ve made my fair share of rainbow cakes, from a Rainbow Mousse Cake to a blinged-out Pot of Gold Rainbow Cake. But THIS rainbow cake version might just be my very favorite of them all! 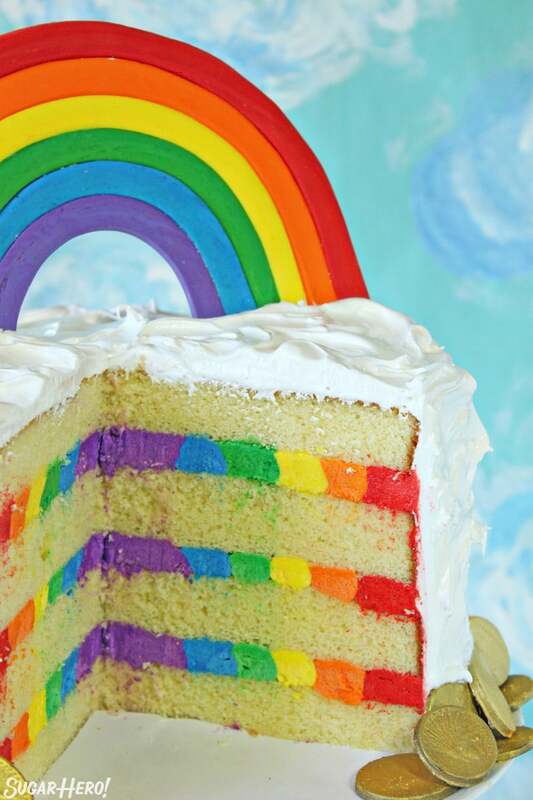 For today’s rainbow cake, we’re leaving the cake alone—no more bazillion layers of multi-colored cake–and instead going with a classic yellow cake. This version is more of a “Rainbow in the Clouds” cake, with swirls of cloud-like vanilla frosting, and a surprise rainbow of gorgeous multi-colored buttercream frosting hiding between each cake layer. 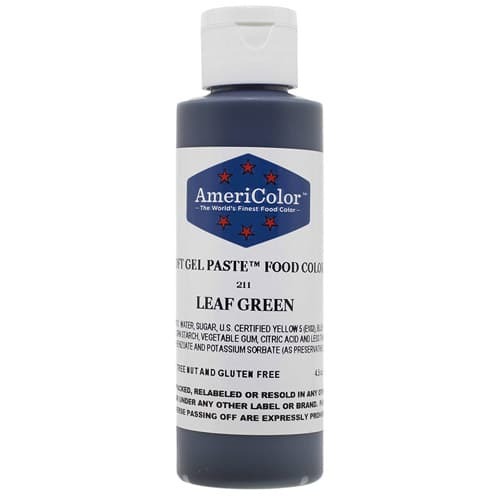 To get the rainbow colors, I recommend using gel food coloring, instead of liquid coloring. 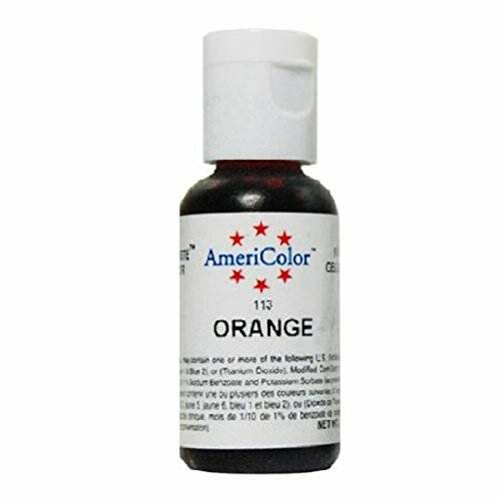 Gel is much more intense, so you don’t have to use as much food coloring to get a bright, vibrant color. 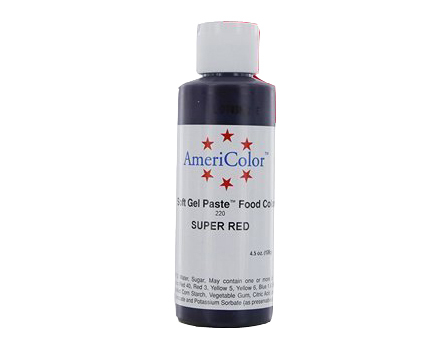 Red is one of the hardest colors to achieve, and you will find that it takes a good amount of food coloring to get a bright red. The good news is that frosting colors will deepen over time, so I recommend mixing the colors and then letting them sit and develop for a few hours–they will become more intense the longer they sit. And a mix of Electric Purple and Regal Purple. After you’ve gone through the trouble of coloring all of the frosting, creating the rainbow itself is easy. Just pipe concentric circles of buttercream on each cake layer. 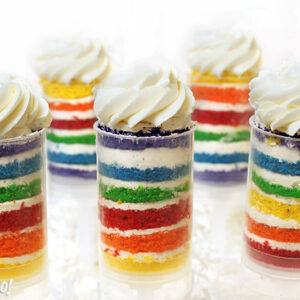 Make sure you use the same order of colors each time, so the layers look identical once you slice into them. 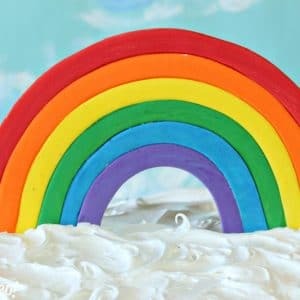 All of that food coloring work is totally worth it, once you pipe those bright rings of buttercream and see your rainbow start to take shape. I loved this cake even before I cut into it—how could anyone not love that cheery rainbow bulls-eye? It wasn’t enough to have a super stealthy rainbow hidden in the clouds—I wanted a big honkin’ in-your-face rainbow, too. So I made one out of fondant and set it on top of the cake for the perfect topper! The decoration has to be made several days in advance, so it has time to dry and harden and be stable enough to stand up on its own. Wondering how to make a fondant rainbow of your own? Of course you are. I’ve got your back! Check out how to make a fondant rainbow cake topper here. 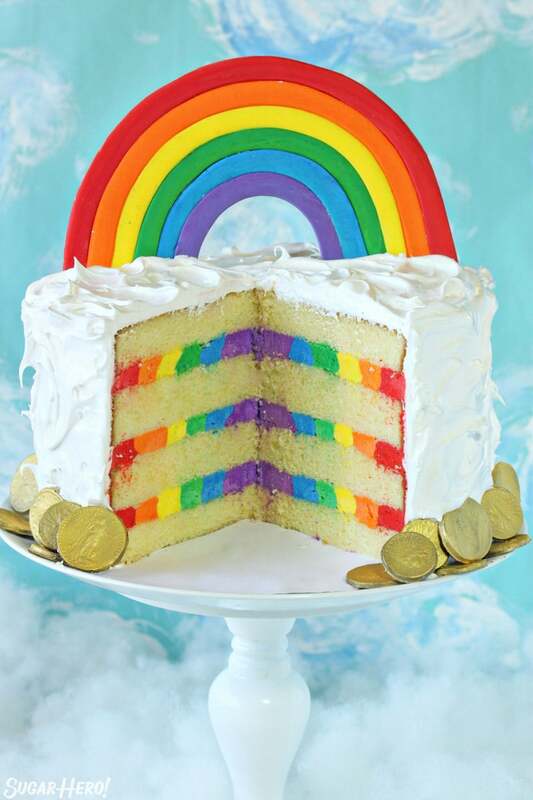 And those coins at the bottom of the rainbow cake? Chocolate coins, of course! 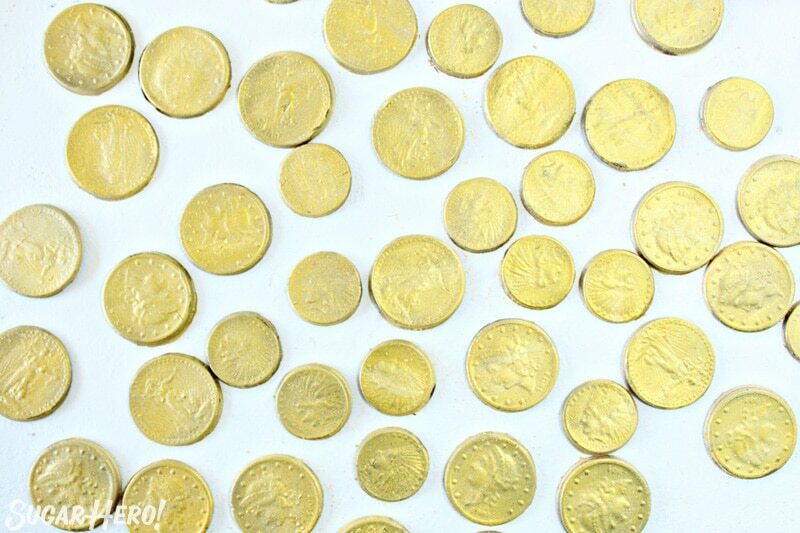 I did have a chocolate coin candy mold from another project, so I made my own chocolate coins (using this coin candy mold) and sprayed them with gold Wilton Color Mist. The coins are optional, but I do think they give the cake a bit of that leprechaun je ne sais quoi. I tried to balance things out by using a yellow cake recipe that only uses yolks, so it doesn’t feel as wasteful. And you will be able to feed a LOT of people with this mega cake, so all of those eggs are going to a good cause. But because I know that some people don’t like recipes that require so many egg whites, please know that you can use any buttercream recipe in the center, so feel free to swap my Swiss meringue one with a traditional American buttercream instead. And after all that, how does it taste? Like the best dang homemade cake you’ve ever had! How could it not, with all of those layers of cake and frosting? I chose to keep things simple and used lemon flavoring in the cake and buttercream, but you could use plain vanilla, or almond, or coconut, or orange, or even mix and match… you get the idea. It’s not about the recipes so much as the technique and presentation, so I hope you take this idea and run with it. And please, show me what you make if you give it a try! 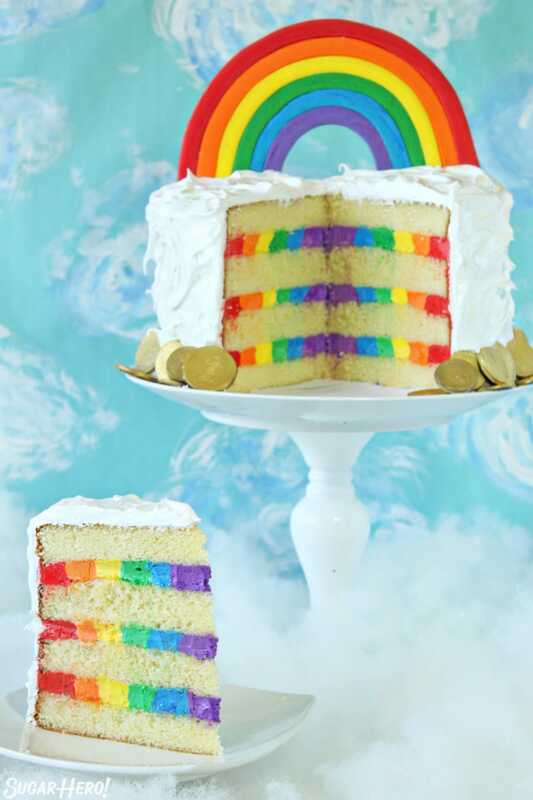 Rainbow in the Clouds Cake - this gorgeous cake has a rainbow on top AND a frosting rainbow hidden inside! It's perfect for St. Patrick's Day or any party! 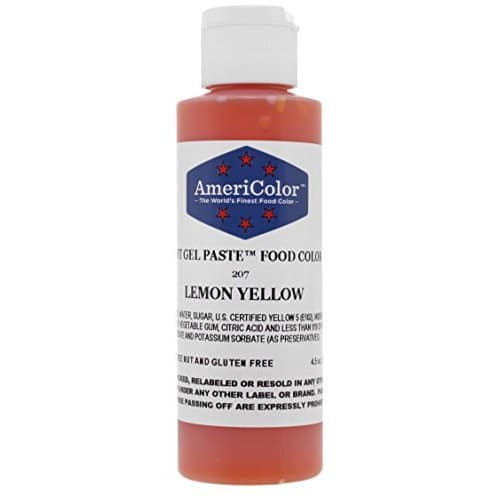 I chose to flavor my cake and buttercream with lemon, but you can use any extract you like: vanilla, coconut, almond, and orange would also all be delicious. Combine the sugar, cake flour, baking powder, and salt in the bowl of the stand mixer fitted with a paddle attachment. Mix on low speed for about a minute to combine the dry ingredients. Lightly whisk together the egg yolks and about a quarter of the milk (it doesn’t have to be a precise measurement) and the lemon extract, and set aside for now. Add the remaining milk and the softened butter to the large mixing bowl and mix on low speed until the dry ingredients are moistened. Turn the mixer to medium speed and mix for a minute and a half. Add the egg yolk mixture in three batches, mixing for 20-30 seconds after each addition, until you have a smooth batter. Scrape the bottom and sides of the bowl with a rubber spatula, and give the batter a few more stirs to make sure everything is incorporated. Divide the batter between the four pans—if you have a kitchen scale, each pan should get about 20 oz of batter. Bake them at 350 F for 30-35 minutes, until the sides just start pulling away from the pan, and a toothpick inserted into the center comes out clean. Let the cakes cool on a wire rack for 10 minutes, then gently turn them out and let them cool completely. I find it’s easiest to assemble cakes that have been chilled, so if you have time, wrap them with plastic wrap and put them in the freezer for at least 30 minutes, until they are firm but not frozen all the way through. If you are making these in advance, they can stay in the freezer for up to several weeks. Let them partially defrost, until they are firm but not rock-hard, before assembling. Combine the egg whites and the granulated sugar in the bowl of a large stand mixer, and whisk them together. Choose a small saucepan that lets you fit the base of the stand mixer snugly into the top of the saucepan—this is your makeshift hot water bath. (Alternately, you can use a different bowl or an actual bain marie and then transfer the mixture to a mixing bowl once it’s heated.) Add an inch of water to the bottom of the saucepan, and bring the water to a simmer. Place the mixing bowl on top of the saucepan, making sure that the bottom isn’t in contact with the water, and heat the egg white mixture. Whisk frequently so that the egg whites don’t cook. 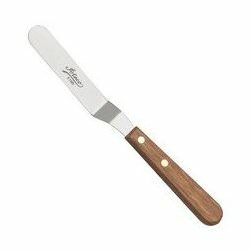 Continue to heat the whites until they are hot to the touch, and when you rub a bit between your fingers, you don’t feel any grittiness from the sugar. Once the whites are hot, transfer the mixing bowl to your mixer and fit it with a whisk attachment. Beat the whites on medium-high speed until they are a shiny, stiff, voluminous meringue, and are no longer warm to the touch—feel the outside of the bowl, and make sure that it is around room temperature. Depending on your mixer and the temperature of your environment, this may take 15-20 minutes, or more. Reduce the speed to medium-low and add the softened but cool butter in small chunks, a tablespoon at a time, making sure to wait in between additions. It may separate or look a little gloopy at this point—fear not. Once all of the butter is added, increase the speed again and whip until it comes together and is light and fluffy. If, after 5 minutes, it hasn’t come together, refrigerate the mixing bowl for 5-7 minutes, to cool the mixture down, and whip it again until it has thickened and is smooth and silky. Add the vanilla extract and salt. When you're ready to use it, divide it between 6 bowls. You'll need to estimate the portions, but you'll want to have 3 of the frosting portions smaller (for the colors that are in the center of the cake) and 3 of them larger (for the colors that go around the outside.) In my case, I mixed smaller amounts of purple, blue, and green, and larger amounts of yellow, orange, and red. If you're not worried about every rainbow frosting layer having the colors in the same order, you can make the frosting portions approximately the same size and just pipe the colors in a different order for each layer, so you'll use about the same amount of every color of frosting. Color each bowl with a different gel food coloring, adding enough so that you get a strong, vibrant color. Transfer each color to a pastry bag fitted with a large round tip. First, assemble the cake so it can be chilling while you make the fluffy cloud meringue. Trim the tops of the cakes so that they're level. Place one cake round on a cardboard cake circle, and pipe a circle of purple frosting in the center of the cake. Pipe a thick blue ring around it, then add a green ring around that. Continue to pipe circles of buttercream, adding yellow, orange, and red colors, until you reach the edge of the cake. Add a second cake round on top, and repeat the frosting circles. 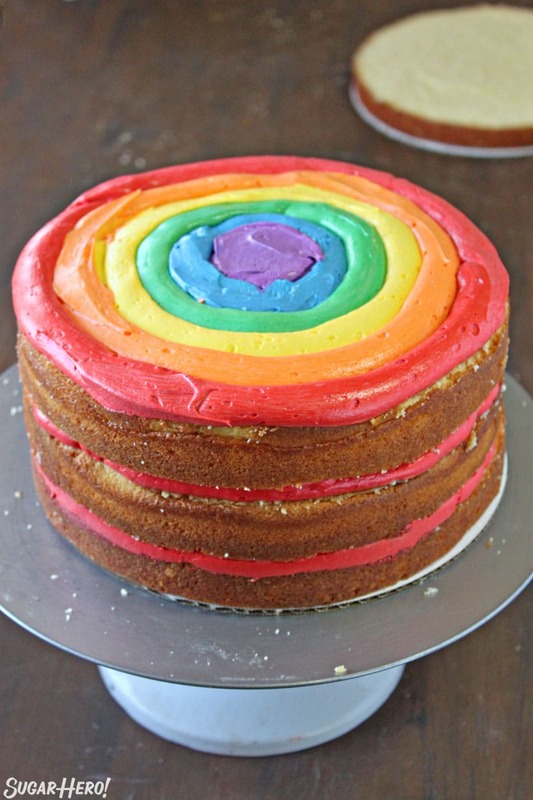 Add a third cake round and use the rest of your frosting to make the final rainbow frosting layer. 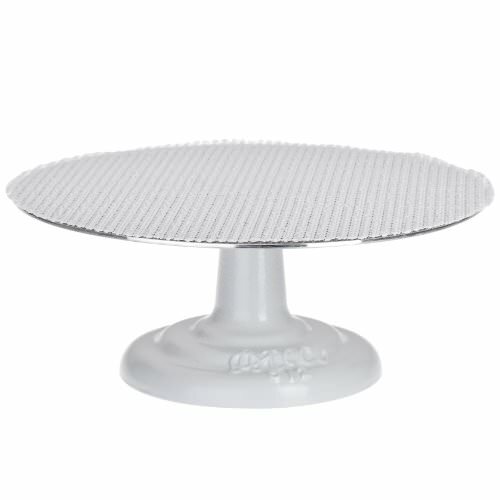 Place the last cake round on top, press down gently, and make sure the sides of the cake are straight. Refrigerate the cake while you prepare the meringue topping. Beat the whites on medium-high speed until they are a shiny, stiff, voluminous meringue, and are no longer warm to the touch—feel the outside of the bowl, and make sure that it is around room temperature. Add the vanilla extract and salt and mix them in. Pile a big cloud of meringue on top of the cake, and gently cover the tops and sides with the fluffy meringue. Use a spoon or spatula to create big swoops and swirls in the meringue. Place the fondant rainbow on top of the cake, and stick two wooden skewers behind it to prop it up vertically. 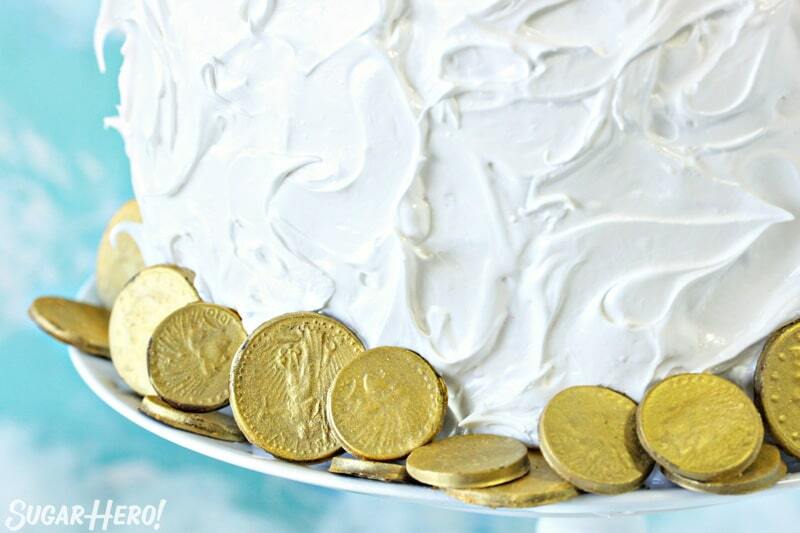 Scatter the gold chocolate coins around the bottom of the cake. For the best taste and texture, this cake is best enjoyed at room temperature the same day it is made, but it can be kept for several days in the refrigerator. (The meringue on the outside will get chewier as the days go on.) The assembled cake can also be made several days in advance and kept, wrapped in plastic wrap in the refrigerator, until you're ready to add the meringue and serve it. This post was originally published in March 2015, and updated in March 2019. This cake is so fun! It reminds me warm weather and sunny days. Love that colorful filling. This cake looks fantastic. My daughter was walking past me looking at this cake on the computer and stopped and said she wants it for her 19th birthday. You know you have a hit when a teenager likes your stuff. Keep up the great work. I so look forward every week to what your coming up with. THIS. This is amazing. I am so impressed with your rainbow-making abilities, both frosting and fondant. Did you PAINT that backdrop? With your whimsical abilities, have you ever considered writing a children’s book? Perhaps a series about a scrappy young baker? Lizzy the Baker? Newbery Medal Winner for sure. So cute! Looks like a dream! Oh.My! This is the happiest cake I’ve ever seen!!!! ‘WOW’ doesn’t even do it justice. My 11 year old daughter was sitting next to me while I was reading the post and then said “WOW” as soon as she saw the first picture, and then when I scrolled down to cut cake, she was like “WHOOOOAAAA! This is unbelievable!” I love the rainbow frosting on the inside and can’t wait to play around with the idea for my kids’ birthdays coming up in April. And girl? You made the gold coins?! You are out of control!!! This is so brilliant! Anytime you amaze me like this, I’m always like, “OOH I’M GONNA TRY THAT … Wait, who am I kidding. An Elizabeth I am not.” But this? Just the frosting rainbow inside? I can manage that. And now I really wanna do it! What a beautiful cake!! 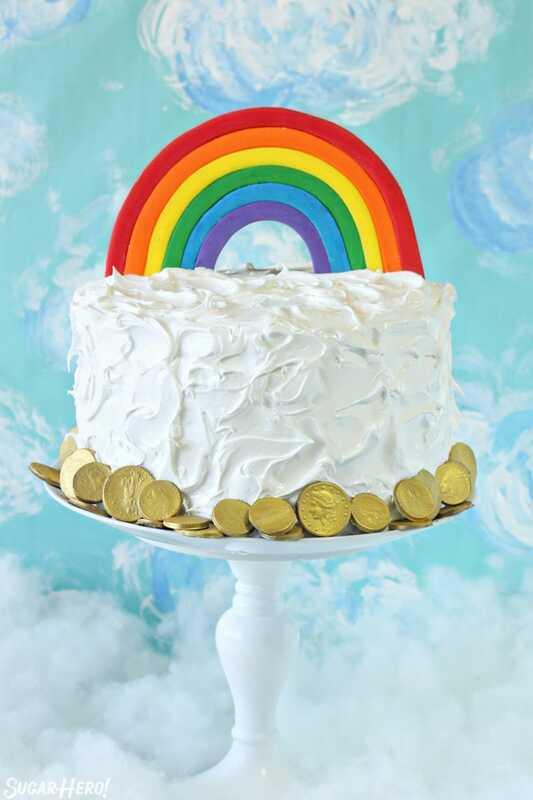 It really looks and feels like you are in a cloud… Mr Leprechaun will definitely love this cake. Granulated sugar for buttercreamm Really ?? Not confectionery sugar? Hi Jeanne, This is a type of frosting called Swiss meringue that does indeed use granulated sugar. It’s combined with egg whites and heated, so the sugar dissolves and there is no hint of graininess. It’s a favorite of many bakers and (personally) my favorite as well! You can feel free to substitute your favorite frosting recipe if you prefer. I know your website says you’re pro-butter, but in my family, all cakes and frostings are made with Olivio because of concern about heart disease. The biggest problem is the softness of non-chocolate frostings, which can get very melty at room temperature unless you add so much sugar they taste metallic. So, I’m fascinated by your Swiss buttercream because of the egg whites. I’ve never made a buttercream (Olivio-cream) with egg whites. Do you think they would help the frosting stay firm, even if the Olivio gets soft? Ever tried it? On a separate note, I was wondering how well the white meringue frosting on the top of the cake hold up compared to the meringue for a lemon meringue pie, which starts to shrink and get weird after a day or so. i made a mini version of this using a different cake recipe (homemade funfetti) and American buttercream for the rainbow (i’m allergic to chicken eggs so I use duck eggs and they are WAY more expensive so…) but that meringue frosting? SO GOOD! i may have found my new go-to frosting recipe. super easy to make and work with, easy to color (I made it grey) and it held up really well in the fridge overnight as well. I don’t make cake very often but i’m already looking for an excuse to use it again. Hi. Curious, in your post you said to use 4 9 inch rounds or 2 9×3 inch. Did you mean 9×13? Hi Leanne! Sorry for the confusion. I meant 9-inch pans that are 3 inches tall. 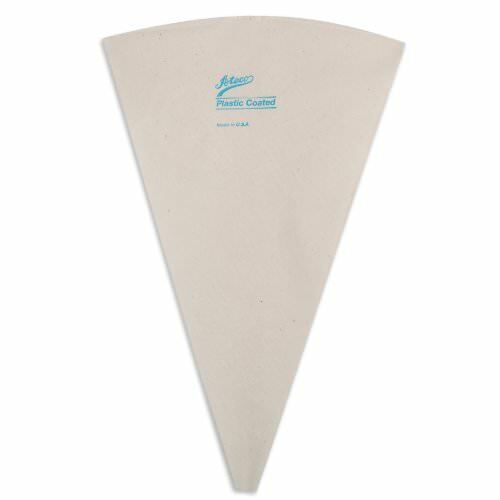 Many cake pans are only 2 inches, so the layers are shorter and more pans are required. 3-inch tall pans means you can make much taller layers, so you need fewer pans (and a longer cooking time). My mistake–that was some lazy recipe writing! I don’t have a kitchen aid with a paddle mixer. Can I still make this recipe? 24oz or 6 cup sugar? I’m confused. This one is confusing me too – why are the sugar and flour both 21 oz, but then say 3 cups and 6 cups? Is the 21 oz by weight or something? Really looking to make this for my daughter’s birthday, but I need to understand that part first. This is actually a common question. If you want to follow the link here: https://www.sugarhero.com/frequently-asked-questions/#measurements I explain the answer! I would love to see how the cake works out! Thanks so much! Happy Birthday to your daughter! 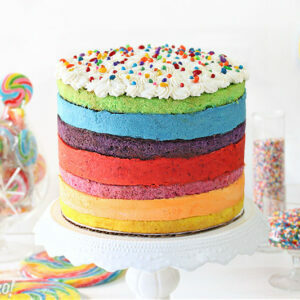 I love the look of this cake with the rainbow filling. I’ve finished my fondant rainbow and it’s ready to go. 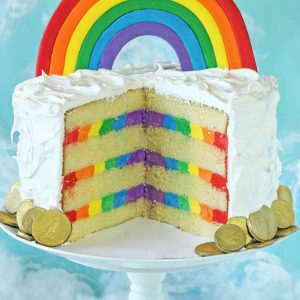 In your opinion, do you think the rainbow filling would look OK inside of a chocolate cake with light skyblue buttercream on the outside. I’ve already made two chocolate flavored 12×4 cakes to be torted. I’m debating on whether to start over and use a white cake and freeze the chocolate cake. No way, I think it would look stunning with a chocolate cake! The bright colors against the dark background would really pop. And sky blue would be so fun out the outside! 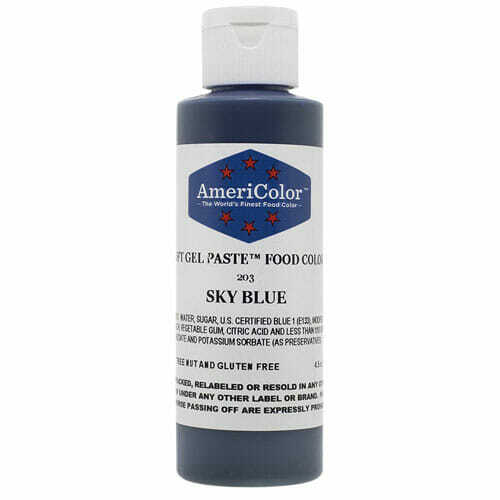 I’d consider adding some white streaks (watercolor style) to the blue to represent streaks of clouds. Just a thought! Please come back and share a picture when it’s all done! You can upload one from your computer along with a comment so everyone can see. 🙂 Hope it turns out well for you! Haha, you’re not wrong–why is coloring frosting so annoying? It just takes ages! Thank you so much, I really appreciate it! How do I store this cake and how long does it last.